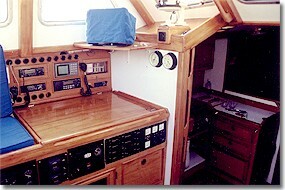 Taonui was built by Dubbel & Jesse in Norderney, Germany in 1988/89. Coryn and I purchased her in 1996. She is probably best described as a pilothouse sloop built on traditional lines, with moderate overhangs, a full keel and deep bilges. The rudder is hung on the back of the keel. The propeller is in an aperture between the keel and the rudder. She was designed to make comfortable long ocean passages, particularly in high latitudes. 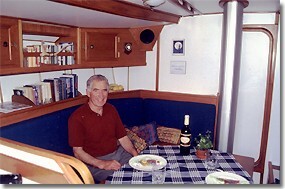 The hull is aluminum, 10mm at the keel, 8mm below the waterline, 6mm above the waterline and 5mm on the deck. There are three watertight bulkheads. Length overall 13.3 meters; Draft 1.8 meters; Beam 3.9 meters; Displacement 14-15 tons. The keel-stepped Selden mast is 16.6 meters above the deck. It is fitted with double spreaders and mast steps. 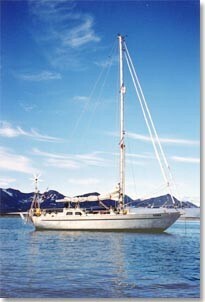 Twin poles are carried on the mast. They are used to pole out the genoas when running down wind. The upper shrouds and outer forestay are 10mm, the lowers and the inner forestay are 12mm. There is a detachable staysail shroud of 8mm, and 8mm running back stays that are used with the staysail and the inner genoa. Taonui is tiller steered. 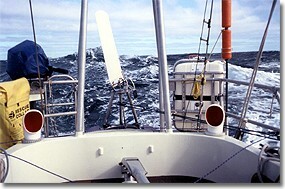 Self-steering is by means of a Monitor wind vane or by a Simrad AP2000 electric/hydraulic auto pilot that connects directly to the rudderstock. The motor is a Bukh 46HP Turbo 3 cylinder diesel, with an in-keel cooling system. 800 liters of diesel can be carried in twin tanks above the engine on either side of the pilothouse. There are four 98 Amphr batteries charged by a 50 Amphr alternator on the engine. There are two solar panels above the pilothouse. Although these are of little practical use on a passage, they do provide a steady 2 - 3 amp charge when at anchor. Instruments: Raytheon GPS (plus 2 spares), Icom VHF, Ham/SSB radio, Thrane and Thrane Inmarsat C transceiver, IBM laptop used for weather faxes, Inmarsat C messaging and Winlink emails, a 110-volt inverter (used to power the laptop), wind speed and direction indicator, Furuno 1712 Radar, Vesper Automatic Identification System, barograph. In the main cabin there is a gravity fed Reflex diesel heater. There are two water tanks in the keel with a combined capacity of 700 liters. 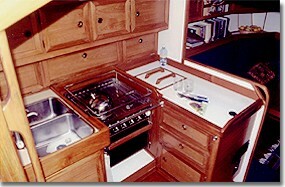 Cooking is on a Force 10, 3 burner propane stove and oven. There are two 20 lb tanks of propane stored in a sealed box in the stern with a vent overboard. A 20 lb tank lasts about 7 weeks. To read the most recent survey of Taonui (October 2009)please click on the link below. Taonui carries two dinghies. One is an 8-foot fiberglass rowing dinghy that is carried on deck, aft of the mast. The other is an Avon inflatable that is stored in the anchor locker. A 2.5HP outboard is carried on the pushpit. There are three anchors on board; a 66 lb Bruce, a 45 lb CQR and, as a spare for the Bruce, a 65 lb CQR. There is 260 feet of 3/8th chain and a powered windlass. Stored in the anchor locker are two 250 foot 3/4 inch nylon lines and one 300 foot 1 inch polyprolene line. We use these to secure Taonui to the shore in anchorages subject to high winds. If we can't get lines ashore we use two anchors in tandem. The first anchor down is the 45 lb CQR which is connected to the head of the 66 lb Bruce by 25 feet of 3/8th chain. Kelp grows in profusion in the high latitudes. An essential piece of equipment is a long handled machette used to cut away kelp that inevitably accumulates on the chain and anchor.